Appreciative Inquiry (AI) is one of the most exciting and increasingly recognized concepts being used to facilitate organizational change. 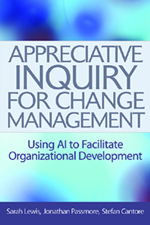 This book studies AI in depth, illustrating the method of asking particular questions and envisioning the future, encouraging staff to consider both the positive and negative systems in place and to recognize the need to implement change. It demonstrates how AI can be practically applied by combining the skills, perspectives and approaches from this book into a practical conversational approach to organizational challenges. It also takes a look at other techniques used to create change through conversation. Case studies from organizations that have already integrated conversational methods into their change management practice show why the processes are valuable, why they are effective, and how to generate such conversations yourself. Written in jargon-free language, this is an excellent resource for discovering the benefits that conversational techniques can have on an organization and its performance.